What’s for dinner? Even though I write a food blog and have food on my mind probably more than the average person, I can’t escape the daily question about our evening meal. You would think that it would be easy for me to throw anything together and to come up with something rather quickly… well, think again. While most of the previous statement is correct, food menu planning and making sure that dinner is ready once 6 o’clock hits is equally a challenge to me as to most cooks in America. This is exactly why I love making soup. In a short period of time, you can throw together a meal that takes only one pot to prepare, it is filling and the perfect vehicle to sneak in extra vegetables, and it is the gift that keeps on giving. To me, soup tends to taste better on the second day than it did on the first. The flavors had some time to develop and make for an even more satisfying and well-rounded meal. This is where Chicken & Gnocchi Soup comes into play. 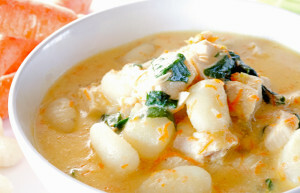 On Saturday, my husband and I went out to eat and I ordered Chicken and Gnocchi Soup instead of salad, so if you have heard or even had this soup before, yes, it is inspired by Olive Garden’s soup with the very same name. Once we finished, I knew what I wanted to recreate for dinner the following day. And I am so glad I did. I was thrilled that I had successfully recreated the taste I loved, and that I will have leftovers for the rest of the week. Already looking forward to the next couple of days. This soup requires basic staples that most of you probably already have in your pantry except for the potato gnocchi. Gnocchi are available in pretty much all grocery stores these days, but if you can’t find them, you could substitute any small pasta. I also used almond milk as the base for this recipe since my hubby cannot tolerate lactose very well. It tasted great, but you could use regular milk or any other milk you prefer. 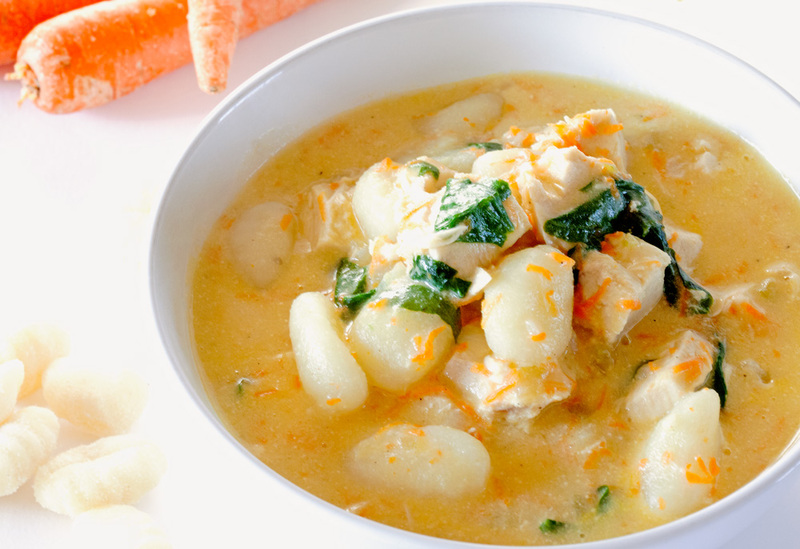 Chicken and Gnocchi Soup will definitely become a new favorite in our meal plan rotation, especially since we’ll have a couple of months of cold nights ahead – perfectly suited for soup! Thanks for starting your week with me. Happy, happy Monday! I hope you have a fantastic week coming your way. 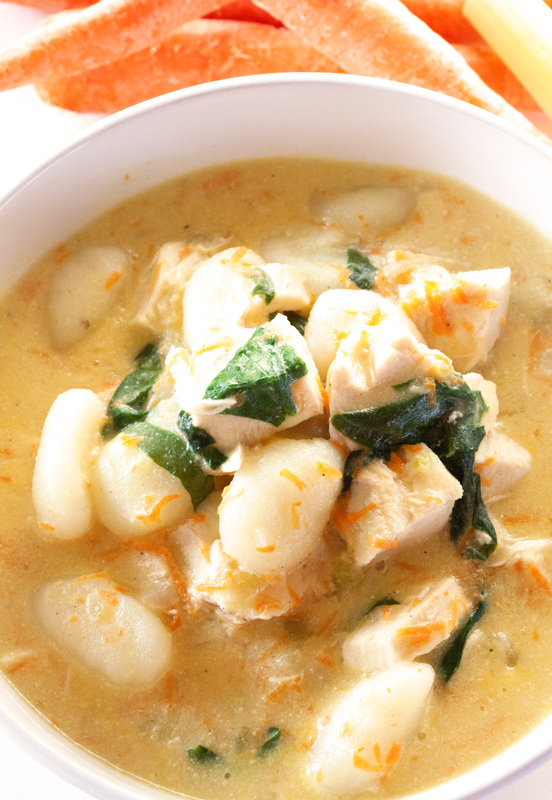 Homemade Chicken and Gnocchi Soup tastes just like the restaurant favorite. 1. Sauté the onion, celery and garlic in the butter and olive oil over medium heat until soft, about 2-4 minutes. Add the flour and cook the mixture for about 1 minute. Add the almond milk and bring to a boil - then reduce to a simmer. 2. Meanwhile, heat a pot of water and bring to a boil. Cook gnocchi according to package directions and set aside when done. (You can also put the gnocchi into the milk mixture once it comes to a boil. Cook the gnocchi according to package directions and proceed with the next step, leaving the gnocchi in the soup. 3. Add the carrots and chicken to the milk mixture. Once the mixture becomes thick, add the chicken broth and bring back to a simmer. 4. Lastly, add the chopped spinach, gnocchi (if you haven't already done so), thyme, parsley, salt and pepper. Adjust seasonings if desired. Serve in bowls, topped with parmesan cheese. Enjoy! This soup freezes really well in airtight containers for up to 2 months or keep in the fridge for up to 3 days. Looks yummy…I think I’ll have to make this sometime! I think Nick would approve! This was delicious. 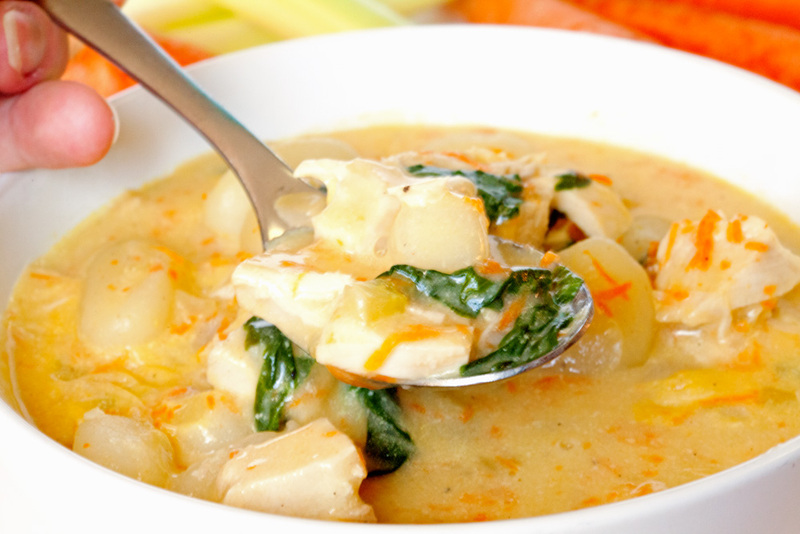 I think you would really like this soup – definitely better for you than the restaurant version :). Delectable! My husband and I greatly enjoyed this. It was my first time using gnocchi, and I intend to alter this recipe slightly for a dairy free wheat free meal!